For the past week or so, I've been testing out football food. You know, game-friendly food. Food that can be eaten in front of the t.v. while the big game is on. Food that can be held in one hand while the other one is raising the roof or balled into a fist of fury. Food that can be done in advance so that viewing time is fully optimized. The funny thing about so many things we consider football food...or finger food...is that it is actually messy. Think dips and salsas (I'm a notorious dribbler), nachos (hey, things tumble off, if can't be helped), and of course wings (sticky, glorious, sauce-on-your-cheeks wings)! But there's a solution to that, and it's called the paper towel value-pack. Or a stack of cloth napkins. But these foods tend to stain, and I'm weird in that I like to minimize stains on my cloth napkins. I'm such a study in contradictions. But back to the matter at hand. Game Day food. Namely, chicken wings. I've been in a wing frenzy this year, which is funny. Some years I can take 'em or leave 'em, but this year I can't seem to get enough. I've been experimenting with all sorts of fun flavors. I've got a couple more to come (and yes, you may even see some after the big game this Sunday - because we all know that there's not enough time in my day to get things done in advance). 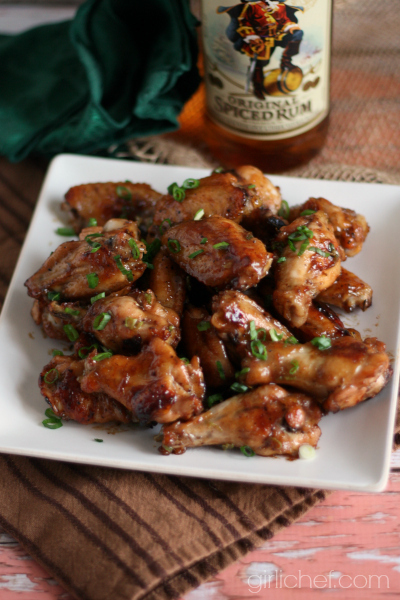 These particular wings highlight the flavors in Captain Morgan's Original Spiced Rum. This is my third round of posts for the #CaptainsTable challenge, mission: Game Day food! When I think rum, I think Caribbean. And heaven knows I could use a Caribbean escape right about now. These negative temps and towering piles of snow have given me permachill. 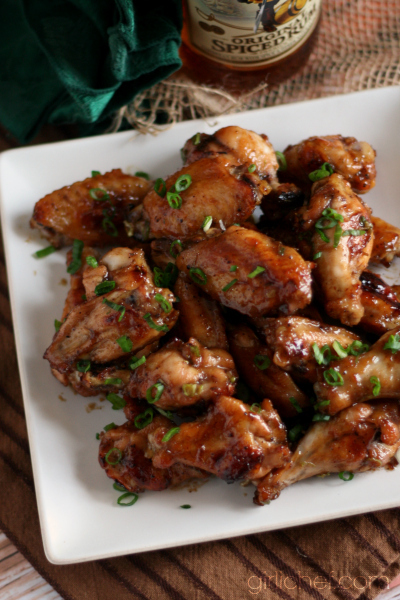 Sticky and lightly sweet with a pleasant underlying heat, these wings are ridiculously easy to eat. I recommend making a triple batch. They're perfect for eating with one hand, so that the other one is free for high-fives. A game day cocktail is coming your way soon! Place all of the ingredients for the marinade in the jar of a blender and puree until smooth. Cut the tips off of the wings. I always put them in a freezer bag (and then the freezer) to add to an upcoming batch of chicken stock. Snip the wings in half to make "wings and drummies". Place in a large container with a lid or a gallon-sized zippered baggie. Pour the entire marinade over them. Cover or seal and refrigerate for 6-8 hours. Preheat oven to 400° F. Line two baking sheets with foil, and then spray with nonstick spray. 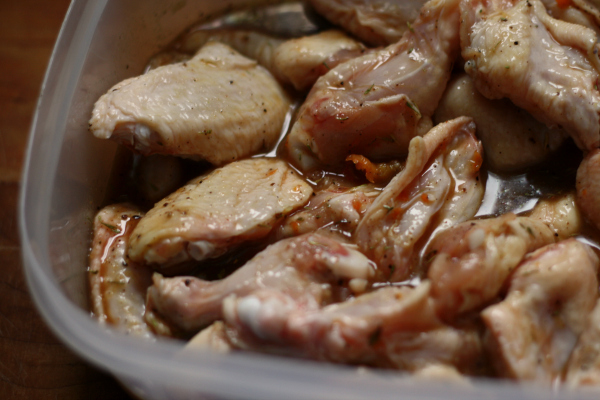 Lift the wings out of the marinade, letting any extra fall back into the container. Set on prepared baking sheets, leaving space between. Slide into preheated oven and roast for 25 minutes. In the meantime, strain the marinade into a medium pot (it will look big, but it saves boil-overs). Bring to a boil, then reduce to a steady simmer. Let bubble until reduced by half, 10-15 minutes. Remove from heat. 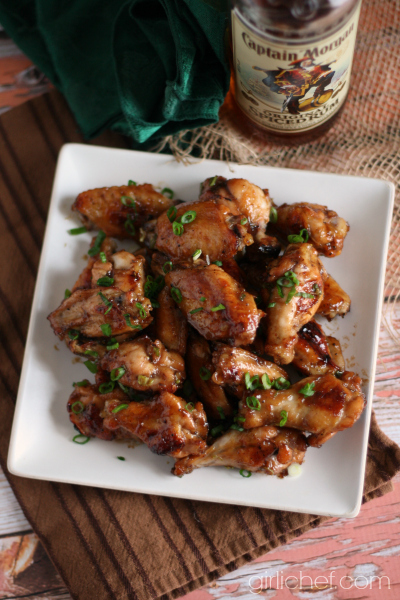 After 25 minutes, quickly brush a thin coat of sauce onto the wings and return to the oven for about 5 minutes. This forms a sticky layer that "grabs" the remaining sauce. 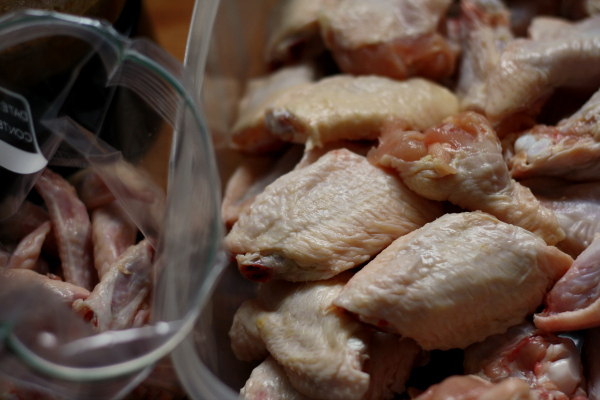 Remove from oven and transfer the wings to a bowl. Pour the remaining sauce over the wings and add all but a few of the sliced scallions; toss to coat. Transfer to a plate and scatter the few reserved scallions over the top. Serve and enjoy! Peel, mince, and smash with the flat side of your knife until you have a paste. Alternately, you could use the pastes that come in the produce section of your supermarket. This post is being entered into the Captains Table Challenge, sponsored by Captain Morgan brand. 15 bloggers, including myself, will be creating food and drink recipes that feature Captain Morgan Original Spiced Rum and/or Captain Morgan Black Spiced Rum from now through February. Each recipe entry that we submit will be judged by Chef Hugh Acheson, and we will have the chance to win some cool prizes. Please join us in raising spirits this holiday season! To see all of my entries into this challenge, please visit my announcement post HERE often, as this is where I will post updates as they become available. This post is sponsored by Captain Morgan brand. I was not compensated, but I did receive product and ingredient reimbursement. All opinions are my own.